We are a training institution that offers Diploma and Certificate courses for KNEC,KASNEB,ICM,ABMA and AIRADS. Join us for quality Computer training at Ksh. 3,800 for 10 Packages. 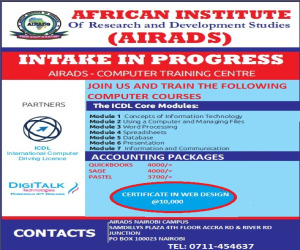 Do you know a course offered in Airads Computer Training Centre? Add the course .